Who says dogs can't reincarnate? This is a story about what I believe to be a case of canine reincarnation. Quite a few years ago, I was fortunate enough to be able to do several retreats in Hawaii, on the Big Island, at a lush, high-mountain retreat center under the auspices of Lama Tharchin Rinpoche. At the time, there was a lovely female Doberman Pinscher in residence who had a history with the retreat center before it became such. Her name was Lhana, and she seemed determined to put people who visited the center at ease, in spite -- or maybe because of -- the reputation of some Dobermans as vicious attack dogs. 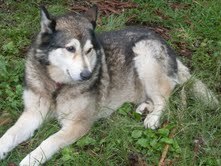 Lhana was uncommonly wise, loving and gentle. She welcomed retreatants with a special gesture that came to be her version of a handshake, calmly coming up next to her human companions, putting her long and delicate muzzle under their hands, and quickly raising her nose several times. She loved sitting in on teachings, where she took up a position near the door so she could greet all with a welcoming wag of her tail and quick warm lick of her tongue, and then lying down quietly with her front paws crossed in front of her, for all the world looking as though she was listening attentively to the dharma. Lhana had been abused by some previous owners and was insecure about being left alone, perhaps fearful that those she now loved would abandon her. One day, for various reasons, all the retreatants and caretakers were off doing errands, and Lhana was by herself on the property. When the caretakers returned several hours later, Lhana was lying on the kitchen floor in great distress. She had eaten quite a lot of white flour, some sugar, and a bag of chocolate chips, almost as if she were trying to comfort herself by making cookies in her stomach. But the chocolate was literally killing her, as it is often fatal for dogs. The caretakers and retreatants were bereft by Lhana's sickness and did everything they could to try and save her. It was a struggle to keep her alive, which they did far longer than anyone thought was possible. Especially after prayers and Rinpoche's blessings, Lhana would rally and almost return to normal, only to relapse as her body tried to overcome the damage to her internal system. Eventually, she died in the arms of those who loved her. A favorite spot of hers on the land, near the main temple, was used for her burial and Lhana was given a very special, very powerful send-off puja by her grieving Buddhist friends. Six months or so passed. During this time, the center's caretakers moved into a new house, which happened to be at the base of the retreat center's mountain. They had another aging dog who was failing physically and so they weren't too enthused when a big, gangly, half-wolf female puppy started showing up and wanting to play. All the time. The pup's energy, enthusiasm, and unabashed adoration of the caretakers was flattering, they thought, but she belonged to an uphill neighbor who had bred her, so they discouraged her visits as much as they could, all to no avail. Hina, which was her name (meaning moon in Hawaiian), would absolutely not take No for an answer, even after getting chased away repeatedly and occasionally sprayed with water. Over and over again, she would return and insist on their attention with her playful antics -- one of her favorite games was hide and seek, when she would crouch in the tall grass until they came close, then bound up into the air with what looked like a mischievous grin on her beautiful, fine-featured face -- until she wore everyone's resistance down. Finally the owner gave in and agreed to let her live with the caretakers, who took over their boundlessly-energetic young new charge with some very understandable misgivings. For one thing, Hina was almost too smart to handle. She was willful, demanding, and had a complete mind of her own. Her energy was unflagging, unlike that of her new owners. Finally they decided to see if they could tire her out a little by having her run up the steep, two-mile road to the retreat center above them. They piled in their four-wheel drive jeep and encouraged Hina to run alongside them, though she quickly streaked way out ahead, the "road" being more of a precipitous, narrow, rock-strewn dirt track than anything. Even though Hina was still a rambunctious, over-sized, overly-intelligent youngster, once at the retreat center her demeanor changed dramatically. After racing around the property for a while in sheer unmitigated joy, she settled into what was to become her "good Buddhist behavior." Whenever visitors showed up, she'd greet them warmly and calmly with a wagging tail and warm tongue. Hina also loved nothing more than being in the main temple during teachings. On one of my last visits, I was standing on the porch talking to the caretakers about Lhana and how much we all still missed her. Just then, Hina came up beside me, put her muzzle under my hand, and quickly raised her nose several times, saying hello to me again in a young new body.